To extraordinarily talented and successful interior designer Julie Hillman when it comes to Paris-- once is never enough. Paris draws her back time and time again, for work and for pleasure, and while she’s always on the lookout for new and fascinating treasurers, the historic landmarks never grow old. Long strolls, market hopping, the art, the food, the old and the new….whether the Left Bank or the Right Bank, it’s an endless romance. Stay at Hotel L’ Abbaye - just moments from Musée du Luxembourg and Notre-Dame, this boutique hotel is charming and a quiet respite from the bustle of the Parisian city. Newly opened, La Reserve, is convenient near rue du Faubourg Saint-Honoré. Take a break from your hectic itinerary at the beautiful Luxembourg Gardens and Palais Royal--the perfect stroll. The Louis Vuitton Foundation , designed by Frank Gehry, and sponsored by LVMH, is a spectacular architectural accomplishment, museum and cultural center. Transportation: I can often be found exploring Paris on a Velib - Paris’ public bike system. With pick-up and drop-off stations every few blocks, there is no better way to take in all that Paris has to offer. It’s efficient, affordable, and allows you to experience this magnificent city at your own pace. For the faint of heart, Uber never fails. Breakfast: There is no other than Cafe de Flore. A quintessential Parisian spot for a coffee, croissant and watching the passerbys. Lunch: Get inspired at La Palatte. Once a favorite of Picasso and Ernest Hemingway, La Palatte is rich in history and worth the price. Also wonderful is L’Avenue and on weekends I recommend Ferdi. Pre Dinner Cocktail: Caviar Kaspia. Dinner: Le Duc or Le Voltaire are both classic french staples. I also love Chez L’Ami Louis on Sunday night and should you feel like being an Italian in Paris, try Stresa. The Flea: If you’re a shopper at heart, you can’t miss the Le Puces Flea Market. Without question this is the largest flea market in the world. However, there is nothing typical about Le Puces. With hundreds of shops carrying every imaginable specialty, it has become a favorite ‘shopping mall’ for professionals and amateurs, coming from all over the world. Marché Serpette and Marché Paul Bert is held every Saturday and Sunday and one of the largest and most well-known areas of the market. One can find a huge selection of art deco furniture, prints, antiques, vintage clothing, and far more. The dealers are tough negotiators, but the quality of their ware is worth the price. Added bonus #1: Outdoor browsing in the summertime is a true pleasure. Added bonus #2: Hedley's Humpers and other vendors located in the market will ship your large and small items home. Problem solved. After the Flea: After you’ve shopped and shipped, there’s more Parisian design highlights. 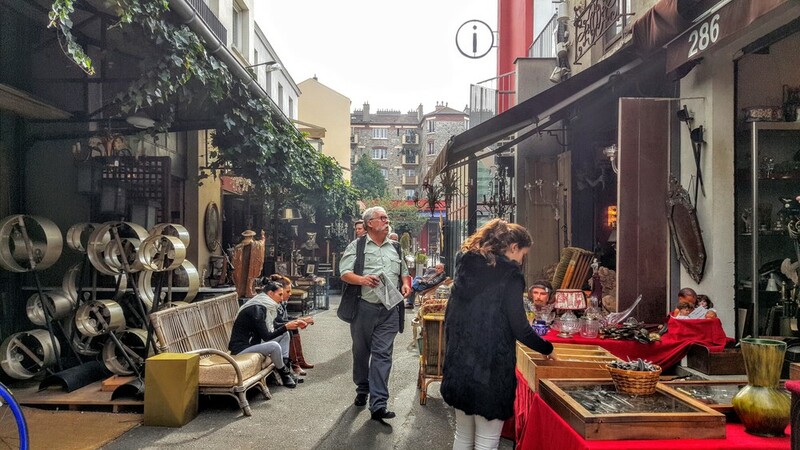 The Rue de Seine is the center for art and antique galleries, while Ruse de Lille has become the place for high-end vintage furniture. And don’t miss my favorite shop, Muriel Grateau. Part art gallery, part boutique, her table wears are beautifully hard crafted and one of a kind. Culture: Between eating and shopping your way through town, be sure to make time for the arts. Paris is chalk full of world renowned museums and although the Louvre and the Musee d'Orsay should be on everyone’s bucket list, I prefer the smaller and more intimate museum settings. Grand Palais always has interesting exhibitions and two of my favorite smaller museums are the Musée Jacquemart-André and the Nissim Camondo. The Jacqemart, once a private home, offers visitors the opportunity to catch a glimpse into 19th century society living, while viewing the family's sensational art collection.